I agree, the book is quite outdated. I am currently working on redoing it all for my next update. Out of everything I have done in the mod, the guidebook is my least favorite thing. I get so wide-eyed and excited for the new systems, sometimes the guidebook gets overlooked. When I do remember it (like in the current update I have been working on), I sometimes find myself trying to talk myself out of updating the guidebook. Haha! I am taking the opportunity to setup the guidebook for localization, which should help. I won't have to sift through a bunch of lines of code to get to the strings I want to edit. It will all be in one easy place. What Minecraft version/version of my mod are you using? Where do I go for crash reports involving this mod? Send me a private message and I can help you out! I think we need some tools that only work to dismount airship. A single arrow hit the airship, we go down so easily. What do you mean by tools? I agree that it can be annoying when you are shot down by a single arrow. I actually made the airships immune to projectiles and explosions in my current update I am working on. Will he come out in Spanish? Not sure! I don't speak Spanish myself, but I do plan on cleaning up my lang file to make it easier to deal with. I want to get that done this current update I am working on. I translated some mods, even though the authors did not add my translation, but other people enjoy my translations, if you like I can help you with the translation into Spanish, I'm from Mexico. At the moment I am translating the full Thaumcraft mod, or good, what I can translate. I've been two days and I can not finish. I love this mod! It is just awesome! Tanks for taking your time and making such a great gift to the community! All the airships we currently have are essentially just the same (except for the looks). It would be nice to have a different use for the airships. 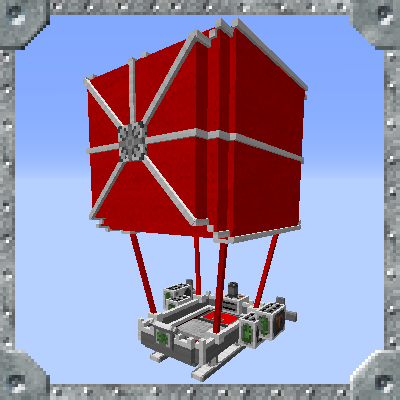 You maybe could add a giant storage airship, which could transport 10 double chests full of items, would be pretty big, but also use more fuel. 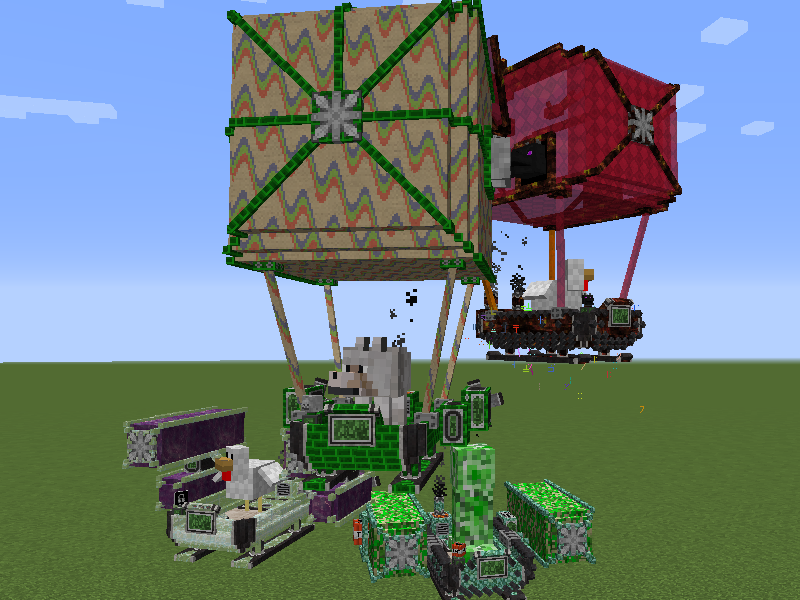 Then there is a speed airship, which also burns through fuel quickly, but is pretty fast, maybe 50m/s (1 meter = 1 block). There should be more airships that work like that. Now, you could say that this already is doable with upgrades, and you would be right, but isnt it kinda boring just having one super op airship which can do everything and you just have to select the right module? It would add more diversity (in my opinion) to the mod, and would make gameplay more fun. At least for me. No reason to apologize for "wasting precious time". I enjoy chatting with people and I like when people suggest things to me. It can sometimes really help put things in perspective. Help me to see things differently, things I may be too close to the mod to see or think of. I appreciate you taking the time to message me. Now on to your suggestion. All of the airships were the same before the update I am currently working on. The only thing that changed was the model and being an airship, there isn't a lot of variants I can work with. It is like trying to make boats a core part of the game. It is use to traverse bodies of water. Airship are no different. I have 4 attributes, and the module system tries to give airship custom variety, but my reasoning for making 1 generic airship is so that players can choose every detail about their airship without making a bunch of items. Models, colors, textures, stats, utility, it all can be done through a single airship (or at least it will in the next update). Personally, I am wishy-washy in games. I like to change things up. I don't want one particular model to define one kind of airship. I also don't want to make items people may not use. Look at the inventory idea. If I made an airship that moves slow, has a static model, and was only for inventory, players wouldn't use it all the time, or at all maybe. I have a handful of other mods that can transport items, so why waste material on an airship I may use 2-3 times a map? Now switching on the storage module to give my airship the temporary utility, then changing it back to my fast airship is better in my opinion. Nice, thanks for the reply. >Have one(1) kind of airship. I do too. So far the update is sailing right along. Fixing a lot of things that have been annoying me as well, like when you press "r" outside of an airship and as soon as you start riding one, the airship GUI pops right up.